Storm Clean Up: Do you have damage from a storm? The Lingo Group is your souce for storm clean up from the beginning to the end, offering emergency service. Safety is always our top priority. 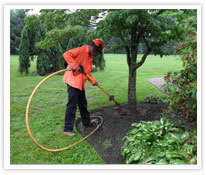 Root Collar Excavation: Over-mulching of trees can suffocate the roots and lead to the decline of the tree’s overall health. 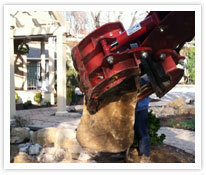 Removal of excess soil and mulch with an Air Spade promotes healthy root growth and allows for proper drainage. Dumpster Services: Call us for your clean out needs. We can deliver, drop and remove our container that you load with limited notice. Shed Foundations: If you are planning to install a shed, Lingo can excavate and prepare the base foundation before the manufacturer delivers or builds your new shed. Firewood: Call us and we can deliver the firewood you’ll need for those cold winter days. If you need help with stacking, please inquire.